The first thing that threw me about Jason Rohrer's new multiplayer video game was that he told me I could only play it with money on the line. Real money. MY money. Then he said the game would mail me a check if I won. It was all legal, he assured me. The game in question was conceived by Rohrer after he got interested in playing Texas Hold 'Em poker and decided he wanted to make an online multiplayer game that put money on the line—better, one that was entirely skill-based and therefore wouldn't run afoul of laws that prohibit gambling online with so-called games of chance, which, believe it or not, poker is ( mostly) considered to be. Whether Rohrer is indeed creating a replacement for online poker, which is largely banned across the U.S., remains to be seen. His game isn't even done yet. But what you can see—what I can show you below—is the clever and somewhat devilish game that Rohrer, an inventive and unpredictable game designer, has come up with. I've played it. The game is called Cordial Minuet,though that name is an anagram for perhaps a more demonic phrase. It's a game about numbers—numbers arrayed in magic squares in which the rows and columns all add up the same sum. The sum is 111 in this case. There are six rows. Do the math. The occult aspects of Cordial Minuet may be just as surprising to those who know Rohrer's work as the notion that he's making a possible replacement for online poker. He told me he's been interested in the occult for a while, though the themes didn't show up in his earlier, celebrated work, certainly not in his most famous game, the brief and moving game about aging called Passage. 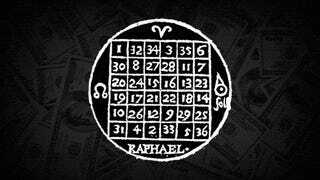 The occult seemed like a must as Rohrer began working to concoct a good money game. "As I researched the history of such games, I found that religion and gambling converge long ago at the same root," he said. "Dice were once used to communicate with the gods, and temples originally doubled as casinos." He'd make a game that was reverent to those roots. And so we played the game, me vs. Rohrer, in the Kotaku offices in SoHo in New York City. Rohrer took a seat in one of our office chairs, loaded the game on one computer while I loaded it on mine. We couldn't peek at each other's monitors. The stakes were too high. Well, the stakes were about two cents, so not exactly that high. Our game couldn't have lasted more than a few minutes. It was brief, and I won, though surely that's not why I was so impressed with it, right? Cordial Minuet feels like it could have the psychological depth of a fighting game or maybe even of poker, albeit darker. The easiest way to explain Cordial Minuet is to take you through a game and to describe the psychological twists for each turn. I'll tell you about a round I played after Rohrer left where I challenged one of my colleagues (I promised him he could expense things if he wanted to). The minimum pay-in for the game is $2, though players can wager as little as one penny for a game or as much as $999,999,999 with, Rohrer confirmed, bets made in increments of $10,000,000. The game subtracts a credit card processing fee from that initial deposit of $2 or however much and then lets you play with that money until you decide to add more or click the "WITHDRAW" button and have it mail you a check. I challenged Kotaku video editor Chris Person to a match. At the time, I started with less than $4 in the bank. And then I waited for Chris to join. Players can't choose who they play against, and they can't communicate with their opponents. Rohrer figures that, if they could, then one person on one side of the country could intentionally match-make with someone on the other, put a large amount of money on the line and then throw the game, essentially wiring money to their friend. No good. So matchmaking is anonymous. I just happened to know Chris would find my game because, at that moment, we were the only two people on the planet playing Cordial Minuet. There's a lot to explain in the above image. First, you're seeing a magic square, with all columns and rows adding up to 111. The square is different each time, but always adds up the same way. Though these columns are, in a way, random, Rohrer told me he still feels that they each give the player a fair shot at winning. That's why he considers this a game of skill. You can't be, say, dealt a better hand and then just win by doing nothing. You have to make moves using the square. You have to use skill. The actual moves in the game involve picking columns. In my first turn here, I would have to pick one column for me and one for Chris. His version of the game board is tilted 90 degrees. My columns are his rows and vice versa. The columns he picks—one for him and one for me—would be rows on my board. See? My rows are his columns. That's important. To start things off, I have to make two moves on this board by picking two columns, one for me, one for Chris. He's doing the same, picking a column for himself and a column for me—though on my board that means he will have picked a row for himself and a row for me. My first goal: I want the column that I pick for myself and the row that he picks for me to intersect at the highest possible number. Looking at this board, if I pick the fifth column for myself I will be hoping that he's picked picked the fifth column on his board, which is the second row on mine. That would get me a 36. Naturally, he does not want that to happen. My other goal is for the column that I pick for him and the row that he picks for himself to intersect at the lowest possible number. He doesn't want that to happen, either! As we both sit there pondering moves, we're thinking not just about the columns we pick but about the columns that each other might pick. What would the obvious picks be? What does he think I'm going to do? How will he try to counter that? See the green and red marks on the right? They represent the possible final scores for me (green) and for him (red). Before any turns are made, all scores are possible. See the green and red numbers on the left? Those represent the percentage of the betting pool that we were wagering. At this point, we're each wagering 1% of our $2.00 pay-in, so two cents a piece. So I'm looking at the board and trying to figure out which columns I want. Looking at columns, I see my choices, but the rows are what he is choosing. So, which column should I take? The fourth one is alluring because of the 34 and 35, but he can see that. He knows I'll try to pick that row and will cross me up and stick me with the 3. If he did that, he'd be choosing the row that also has the 36 in it. So how about that row with the 36? Should I assume he'll go for that? That seems too likely for him to screw me over on, too. So I'll take the last column where the worst is 12. A conservative play. Now, looking at the rows, what might he take, and how can I cross him by picking a bad column for him? I could see him going for the 31/36 row, but if I try to cross him up with the 3 (fourth column), he might actually score the 34 or the 35 with the fourth or fifth row. Which column gives him the most bad choices? Maybe the fifth is good? Let's try. Note... I've noticed some readers getting confused about what's happening here—understandably! We're NOT taking turns. We are making our moves, on our respective computers, at the same time. I'm committing to mine. He is committing to his. And then the computer shows us the outcome of our decisions. What we've got above is the first sign of how Cordial Minuet doles out imperfect information to each player. Because I know which column I chose for myself, the game will tell me which row he chose for me and therefore reveal which number I've earned. I got a 12. But the game won't tell me which row Chris chose for himself. I can only know that he couldn't choose the same row that he chose for me. The game shows me five possible numbers that he earned. I'm left to wonder. Did he he get a 36? A 22? On the right, the red lines show his potential scores. Since he's in the same predicament on his end, he doesn't know that I've earned a 12. He just knows that I've earned one of five possible numbers in the row that, for me, starts at 26 (remember, it's a column for him). The potential scores that he sees for me are indicated on my screen as green lines (red lines on his). Here's a fun element: the actual possible final scores for me are displayed to me as green dots. He's seeing potential Stephen scores (green lines on my board) based on any of the five numbers he thinks I may have just earned. I'm seeing, via the green dots, potential Stephen scores based on the truth—the number I actually earned, that 12. Comparing the green lines to the green dots, I can see that he might worry that I could get some really high scores, even though the dots show me that I really can't get a very high score. We are, if you haven't figured it out, going to be playing a mind game. I was worried, at the time, that he played me really well and that, of the possible numbers he scored, he may have grabbed the 36. Remember that. Time for turn number two. I bet 30, which means 30% of $2... 60 cents. I start my second turn looking for a column that is likely to give me a good number. I like this second column. I pick the fourth column for him, because the numbers in it are mostly mediocre. I'm cutting him off from many of the potential high scores, though some really high ones remain within his reach, as you can see from the red lines. We both complete our moves, and the results are in. They're... awful? I've earned an 11 to add to my 12. That means I missed the 30, the 14, the 20 and the 28. In the first turn, I earned the worst number in my column. In this second turn, I've earned the second-worst number in my column. The one bright spot is that I now know that he can't have scored the 36 in that first column he took. But this new column may have earned him a 35. Now... check out the possible scores in that shot above. At the end of the second turn, he's still got a pretty good range of potential final scores. And the green lines indicate that he's probably seeing me as having a good range, too. The green dots, however, show a sadder truth. My potential scores are all pretty low. Tragic. We bet 30 more, and I'm left with my final column-picking decision of the game. I'll pick one column for me, and one for him. At this point, I really need a high number. The first column gives me a 50/50 chance of at least getting a 29 or 33. I'll take it! The results are in, and my final move was a wise one. I got a 33, the best possible number in my column. Of course, he just scored a 7, 32 or 18. Looking to the right, the green dot shows me that I got the third-highest of the six potential final scores that he sees for me. I can also see that the score I got is higher than four of his six possible scores. That's good, right? Remember that he knows what his score is, and he knows what my potential scores are. If he got either of the two highest potential scores that I can see for him, then he's sitting there knowing I can't beat him and will now just raise the bet to wipe me out. Or maybe he doesn't have either of those two scores. Basically, there's a one in three chance that he's just earned a guaranteed win. But there's also a one in three chance, based on my score being higher than four of his possible scores, that I am currently beating him. Who is really winning??? He sees me 10 and then the results are displayed. I'm stunned. Would you look at that? Remember back after that first turn when I thought he'd claimed a 36 from that initial column I'd selected for him? The number he actually got from that column was the 2! That means that, while I was fretting about the 12 that I earned in that first turn, all he'd earned was a 2. He'd scored a 23 in the second turn, moving him to 25 points when I had 23. In the final turn, however, he'd only earned seven more, for a total of 32. I landed a total of 56. We played a second game. I'll spare you most of the details, but will just show you the turns. The outcome to this game was even more surprising. It was a tie. How crazy is that? At the end of these two games, I wound up with $4.9065 in my account. And I had a great time. I decided to keep my money in the game. Rohrer charges players to cash out and have the game send them a check. He says that that fee goes entirely to paying the third-party providers for those services. He doesn't take a cut (and doesn't store credit card info either, for that matter). He simply realized that he couldn't afford to eat the cost. "The check mailing service costs $1.50 for mailing a check inside the U.S., and slightly more for checks sent abroad," he told me. "I'm passing this fee on openly to my players. Imagine if a thousand people deposit today and then all ask for a check mailed tomorrow—-I'd be out $1500. After banging my head against the potential dangers of swallowing the fees myself, given the uncertainties of mass behavior, I realized that the only sane thing to do was to be transparent about the fees." Most game developers, he said, worry about computer memory leaks that will make their games run badly. "I needed to worry about money leaks." Rohrer does take a personal cut from each game. He said he's tweaking the percentage but is currently taking 10% of the winnings. In a game in which both players bet 20, for example, instead of the winner taking 40, they'll take 36. He'll take 4. That's how he'll profit from his labor. Rohrer needs people playing the game as soon as possible, so he said that private alpha invites will be going out soon. The more people play, the more the game will be well-tested. It'd be best to keep up with the game on its official and only somewhat creepy website. I was enchanted by Rohrer's game. It was physically simple to play—just five meaningful clicks needed, really—and yet it was a magnificent head trip. Should it be proven to be purely a game of skill, maybe it could be a replacement for online poker. What a turn of events that would be: an indie game developer creates a new superb game of skill that enraptures countless players to compete online for money. This, from the guy who made a simple two-dimensional game about getting old? It will be crucial that Cordial Minuet does indeed skirt any prohibitions on the books against online games, especially involving games that are ruled to be subject to chance. He's not run the game by a lawyer, though he has argued a case on unrelated issues successfully himself. "All gambling laws, both federal and local, hinge on whether a game focuses on chance or skill," he said. "Can you get good at a game, or is it really just an elaborate ritual that boils down to a lottery? And beyond that, courts have asked about the balance between skill and chance in particular games. Backgammon is an example of a chance-based game that has prevailed in court because of its strong skill component. Recent federal internet gambling laws apply to any 'game subject to chance. This squashes the historical 'predominance' test, throwing games like backgammon and poker under the same bus as roulette. "I needed to go further to stay away from this new federal law—-my game could not be subject to chance at all. When you sit down at a round of Cordial Minuet, the game's outcome is decided 100% by the choices that the two players make, and 0% by a random number generator, unlike poker and backgammon. The top score in the round might be 105, and both players have the same opportunity to achieve that score, depending on the choices that they make. Thus, it is not ''subject to chance.'" The key to all of this, for Rohrer, really is the idea of playing for money. Without money on the line, the game just doesn't have the right energy, as far as he's concerned. "Playing for real money is the beating heart of my game," he said. "I recently started playing Texas Hold' Em poker pretty seriously, and this game did something to me that no other game has done. The drama and emotional anguish is magnified tremendously when there's something real at stake. I like games that can reach into real life in a palpable way." I told him that playing the game made my head hurt, that each decision I had to make was really tough as I thought through layers of strategy about what my opponent might be thinking. "The decisions you make in the game should be agonizing," he replied. Indeed, in the best possible way.